6/13 Cup of Coffee: Despite a pair of rainouts there was plenty of action on Thursday. 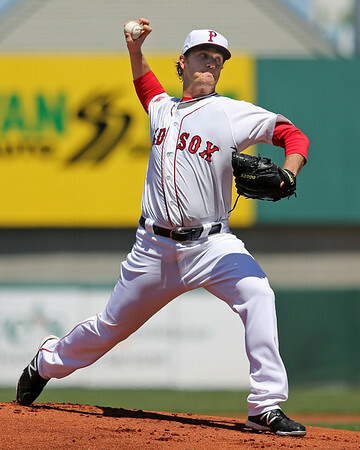 Pawtucket and Salem both got excellent starting pitching in their victories. Rafael Devers continues to dominate the Dominican Summer League, but a two-homer performance wasn't enough as the DSL Red Sox lost in the 13th. Portland and Greenville were both washed out. Pawtucket knocked off the Charlotte Knights (CWS), 6-1. After allowing a first-inning solo home run, Steven Wright (pictured) settled in and was nearly unhittable. The knuckleballer struck out a career-high 10 batters in his seven innings of work. He scattered three hits and walked one. Wright now has a 1.35 ERA in three starts since rejoining the PawSox after missing the start of the season with a sports hernia. Alex Wilson and Chris Resop tossed a scoreless inning apiece to preserve the win. While Wright was knuckling along, the offense put together a balanced attack with 10 base hits and five walks. Christian Vazquez led the way, going 2 for 3 with an eighth-inning home run, a walk, and two runs scored. Mookie Betts and Travis Shaw added two hits apiece, while Alex Hassan was 1 for 3 with a triple, walk, and two runs. Portland was scheduled to complete Wednesday's rain-shortened game with the Altoona Curve (PIT) before playing its regularly scheduled contest, but the weather in Altoona again would not cooperate. The teams will make up the games in Portland, where the suspended game will be played on June 20, and Thursday's rain-out will be played as part of a doubleheader the following day. Salem cruised to an easy 6-0 win over the Lynchburg Hillcats (ATL). Luis Diaz gave up seven hits over six scoreless innings, striking out five and walking a pair. Diaz has won his last four decisions and has lowered his ERA from 4.28 to 3.33 in his last two starts. Nate Reed added a pair of scoreless inning of relief, and Dayan Diaz struck out the side in a perfect ninth inning. The latter Diaz has allowed just one run in 15 innings across 11 appearances since the start of May. Carson Blair led the Sox offense, going 3 for 4 with a pair of doubles, a walk, and two runs driven in. Blair has been on a roll for Salem. The catcher has hit in eight straight games, going 17 for 34 with six doubles and 16 RBI. He has three hits in three of his last four games. Aneury Tavarez hit his fifth home run of the season, while Tim Roberson and Matty Johnson both added a pair of hits. Greenville was rained out of its game against the Hagerstown Suns (WAS). The teams will play a doubleheader on Friday at 5:05. The Lowell Spinners will kick off their 2014 season on Friday against the Vermont Lake Monsters (OAK). See the Spinners full 2014 schedule here. After an early five run lead, The DSL Red Sox took a tough loss in 13 innings, falling 11-8 to the DSL Mariners. The story was once again third base phenom Rafael Devers. The 17-year old was 2 for 5 with a pair of home runs. His two-run shot in the fifth inning gave the Red Sox a 6-1 lead, and he followed that with a solo homer with two outs in the bottom of the 12th to tie the game at eight apiece. Devers also walked, scored three runs and drove in three. In 11 professional games, he has driven in 18 runs. Devers wasn't the only contributor for the DSL offense, however. Carlos Tovar had a big day as well, going 2 for 5 with a pair of doubles, a walk, and two runs scored. Isaias Lucena was 2 for 4 with a walk. Gerson Bautista had a strong start, giving up just one unearned run on four hits in five innings. In nine innings over his first two starts, Bautista has yet to allow an earned run. Unfortunately the bullpen was unable to hold the lead for Bautista. The quartet of Shair Lucas, Algenis Martinez, Carlos Caceres and Jervis Torrealba combined to allow 10 runs across eight innings. For Torrealba, the three runs allowed ended a string of 7 2/3 scoreless innings over four appearances to start the 2014 season. Player of the Day: Despite another great performance from Rafael Devers, the nod goes to Steven Wright. The 29-year-old righty was untouchable after allowing a first-inning home run. His 10 strikeouts beat his previous career high of nine, set in 2011 when he was a member of the Akron Aeros (CLE). In 20 innings, Wright has given up just three earned runs and struck out 23 while walking five.